This is so AWSOME!!!!!!!!! you ROCK!!!!!!!!!!!! I love this song and i sing to it all the time, i love your dresses Amy and wish i would look as good as you in them.i love the way that you don't sing what all the other singers sing you stand out and that really inspires me. This song isn't like the ones you've sang before but it's just as good. My other favourites are paper flowers and my immortal. luv ya! Evanescence rock! 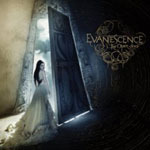 It's the best work EVANESCENCE have ever done.Listen to it!! !Believe me!! !You'll like it.Amy Lee is very gifted.And she is the most beautiful woman I have ever seen!!!!!!!!!!. OH MY GOD I love Evanescence to death!God,I could listen to them ALL DAY!And Amy Lee is the best singer and she's so pretty,GOD! amy is the mom of everyone ok..........and thats all. i love u amy i love all your music u are an angel, keep on singing,u rock half of honduras love u,ok i thik so but my friends do!!!!!!!!!!!!! !